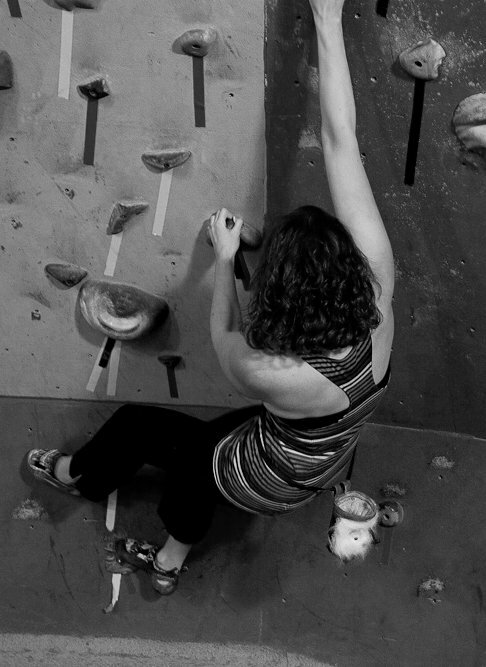 Gear Review: My Chalk Bag is Cooler Than Yours, Thanks to practical climbing! Most of our climbing gear purchasing decisions aren't based on how the piece of equipment looks. Though there are dozens of color options for things like belay devices, the appearance of the gear is less important than its effectiveness. Aside from clothing and crash pads, there aren't many pieces of climbing equipment we can choose that makes a statement about who we are. Tammy Opalka agrees, and has set out to create some of the most durable, unique chalk bags out there to help us all express ourselves. Tammy started sewing custom bags for herself and friends, then founded practical climbing in 2009. Her bags are handcrafted in the United States and her company is the only I've found that will re-purpose old fabrics to create custom bags. (she and Friksn have a newly formed partnership to upcycle some of Friksn's shirts.) This doesn't just ensure climbers get chalk bags that say something about who they are; it's one of the ways Tammy ensures practical climbing is a socially and environmentally responsible company. After losing at least three chalk bags over the course of my climbing career, I picked up a practical chalk bag at PRG Oaks this winter. I also chose one that's so unique, I couldn't possibly lose it! My new chalk bag, dubbed Binky, is one of Tammy's "monster bags." 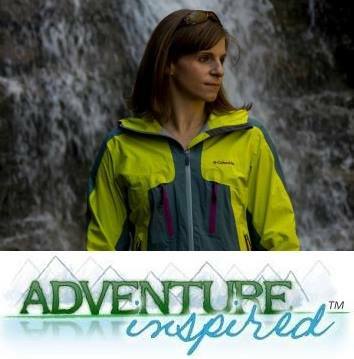 She endeavors to create bags that make climbers happy, and mine definitely fits the bill! The monster bags were originally created as prizes for PRG's Midnight Burn, a bouldering competition that occurs yearly on Halloween, but I think they're perfect year round. My monster bag isn't just cute, it's durable and, well, practical! The inside is lined with a soft fleece material, which feels great on worn out climbing hands. The closure and belt loops are positioned perfectly. I've had it for six months now and it shows no signs of wear. At $18, the monster bags are priced comparably to a good number of less personalized bags out there. Monster Bags and others are available in varying sizes, which, as Laura over at ClimbWithKids discovered, means her little ones have the perfect sized bag for their kid-sized hands. (Read her review!) If goofy monster chalk bags aren't your thing, there are a number of other styles to choose from including hemp bags, solid fabric geo bags, even a Tsunami relief bag with 100% of profits going straight to the Red Cross. 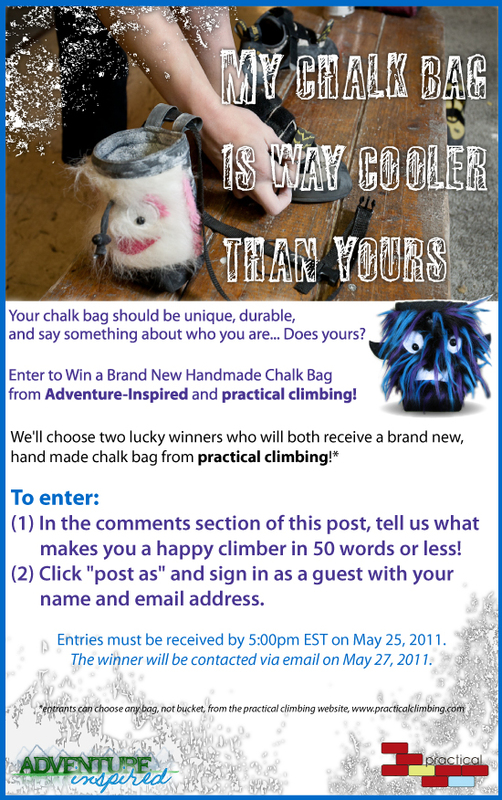 Enter to Win an Awesome practical climbing Chalk Bag! Tammy sent me a complimentary chalk bag to test out as part of this review, and she'll supply the winners with the chalk bags of their choice. But as always, opinions expressed here are my own. the contest is closed! thanks to all who entered. we'll announce the winners soon!